Does anyone buy anything these days without reading *at least* a handful of customer reviews first? The answer is no… or very few. 90%, actually – that’s the percentage of consumers who read online reviews before visiting a business or purchasing a product. People trust each other more than they trust companies. But how can a company encourage current or former customers to leave reviews? This post covers *a ton* of real-life examples of how companies have encouraged customer reviews for better credibility and conversion rates. Before you dive into all these examples, here are a few free templates to help you along. 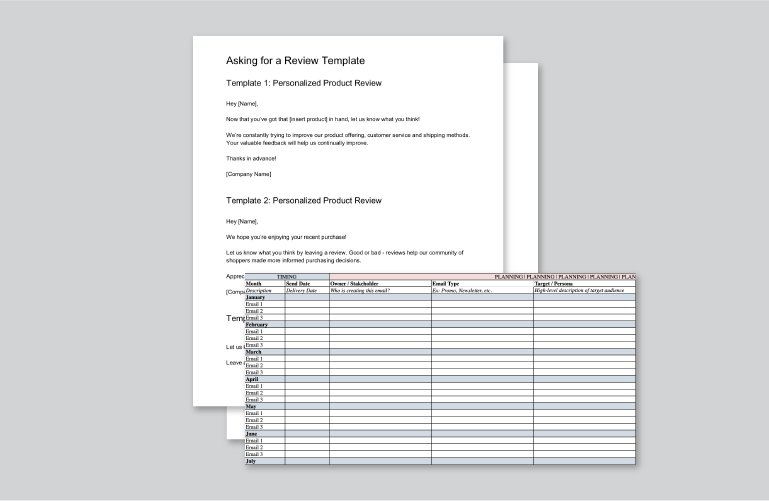 5 “Ask for a Review” Templates to help you communicate with your customers. An Email Marketing Calendar to plan all your outgoing drip campaigns. A Best Time to Send Email Kit to ensure you’re emailing at optimal times. Email Marketing Bundle to get your email marketing strategy in order. 21 awesome examples of how to ask for customer reviews. You’ve made a sale – which is awesome. 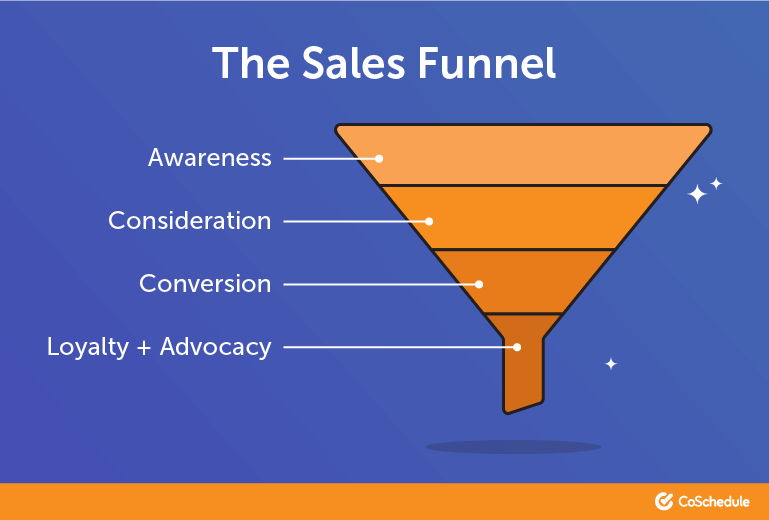 BUT, the sales funnel doesn’t end when someone makes a purchase. The customer lifecycle and funnel extends beyond the sale – where customers are made into loyal advocates. Great service makes for happy customers; happy customers leave reviews; customer reviews make for better product pages; better product pages make more sales. So just sit back and wait for all those great reviews to come pouring in, right? you could take a more proactive approach. 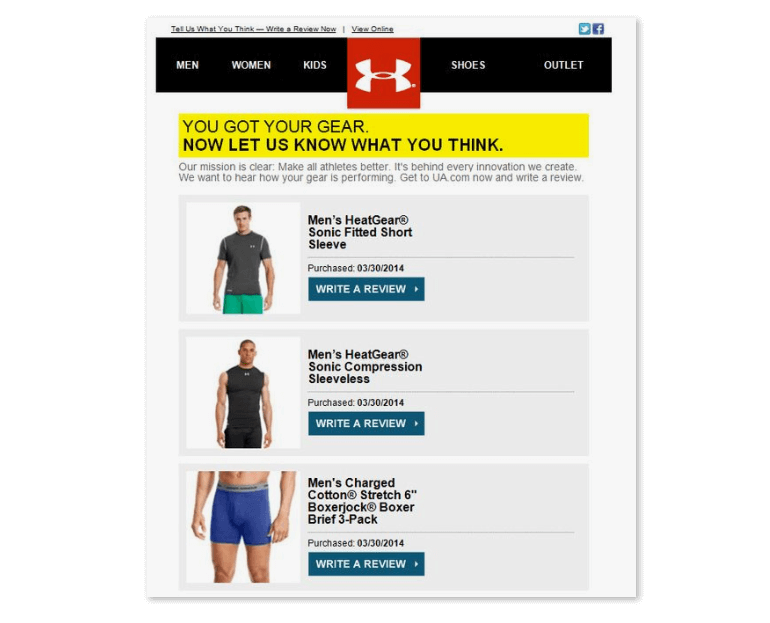 Post-purchase emails which encourage customer feedback play an important role in building loyalty and advocacy. What’s the best way to get someone to leave a review of your product? How can I find some examples of what other companies do? Are there different approaches to this and is one better than the other? This post contains 20 real-life examples of how to ask customers to leave a review... so you can decide what approach you want to try and how to layout your email for the best results. This first thing you’ll want to consider when asking someone to leave a review is if you want them to review the product they purchased or your company as a whole. You’re selling on an external site like Amazon. Your company sells many different products. The item the customer purchased is a new release. The products you sell aren’t big-ticket items. Your company only sells a few products. The products you sell are big-ticket items. Here are a handful of examples of companies that ask for customers to review their products. Here’s a simple example of how to ask customers to leave reviews for products they recently purchased. The company has a dynamic email that auto-populates with the recently purchased products. The customer can easily leave a review by simply clicking on the “share your thoughts” CTA. It’s straight forward; no beating around the bush here. As a customer, you know exactly what the purpose of the email is. It’s easy to navigate. The links make it easy to navigate to the review page. It’s short. 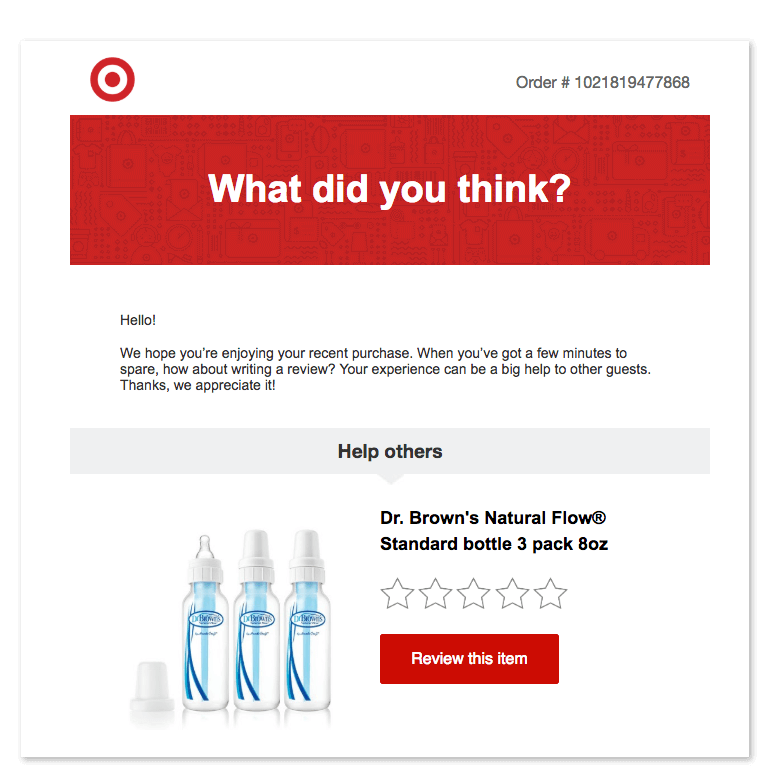 Review emails don’t have to be lengthy. Do like J. Crew and keep them short and sweet. 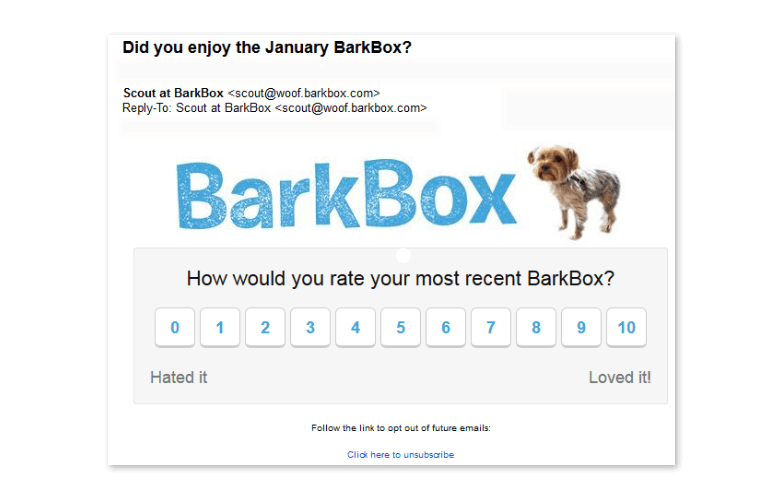 Subscription service, Barkbox, reaches out to customers to rate their most recent box. The email is a good example of how to ask for a product rating when your company only offers one or two services. Since the customer is receiving a curated box of products, Barkbox can use the customer feedback to continually improve its offering. Again, this is a very simple email that gets right to the point. The scale rating makes it easy to rate the product without a ton of thought. 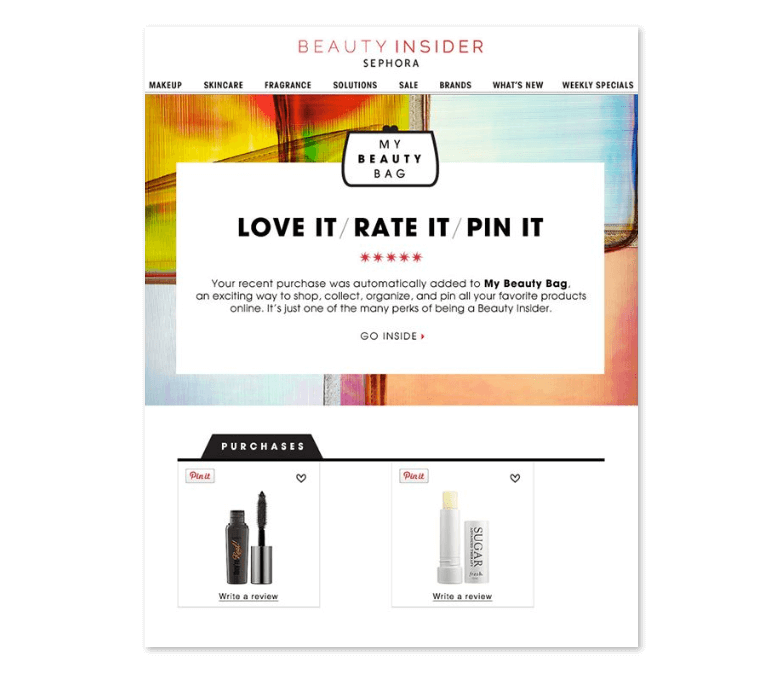 By allowing the customer to rate the product directly in the email, you can increase the likelihood of someone leaving a review. 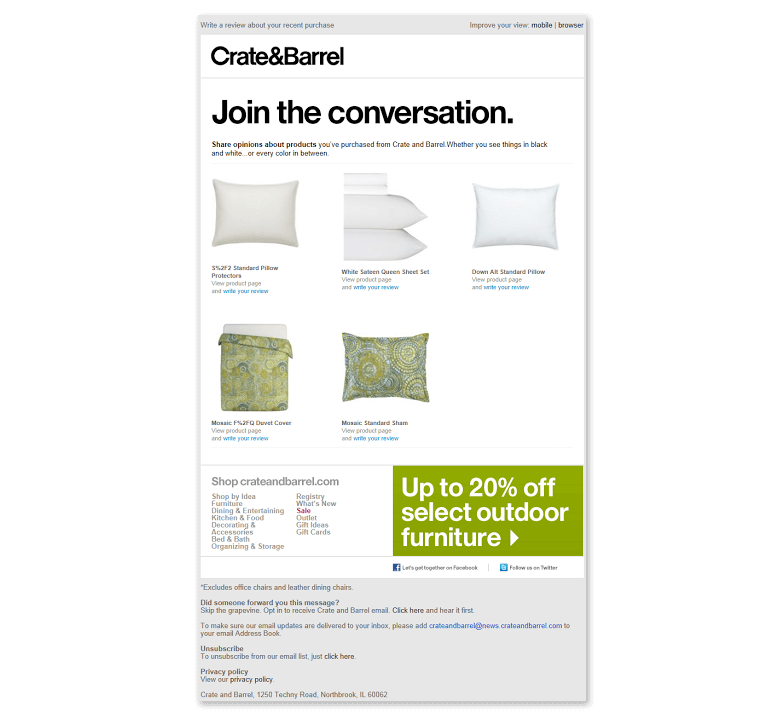 Crate & Barrel takes it one step further by combining a review email with a plug for a current promotion. This makes sense since the individual has already purchased from the company, but it could also distract from the purpose of the email. If you’re going to insert a promotion into your review emails, make sure it is only one and it is included after the leave a review section. The copy is clever and is a play on interior design. Combines a promo to encourage further sales. Takes you directly to the review page. Gap takes a more personal approach by including a personalized intro paragraph. 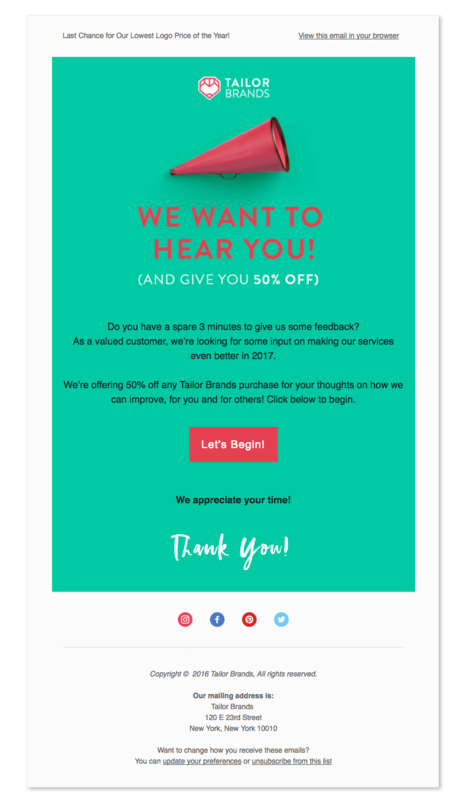 This takes a more indirect approach compared to some of the earlier examples, but it does a good job of making the reader feel like Gap’s customer service cares about their opinion. The headline makes it clear what the company is asking for. Includes the recent order number as a reminder. 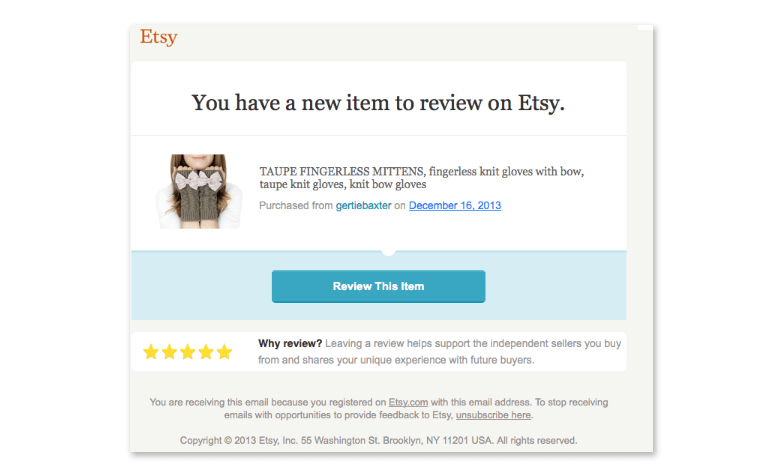 Etsy’s product review emails are written in a way to make it seem like there is a necessary task waiting for completion. 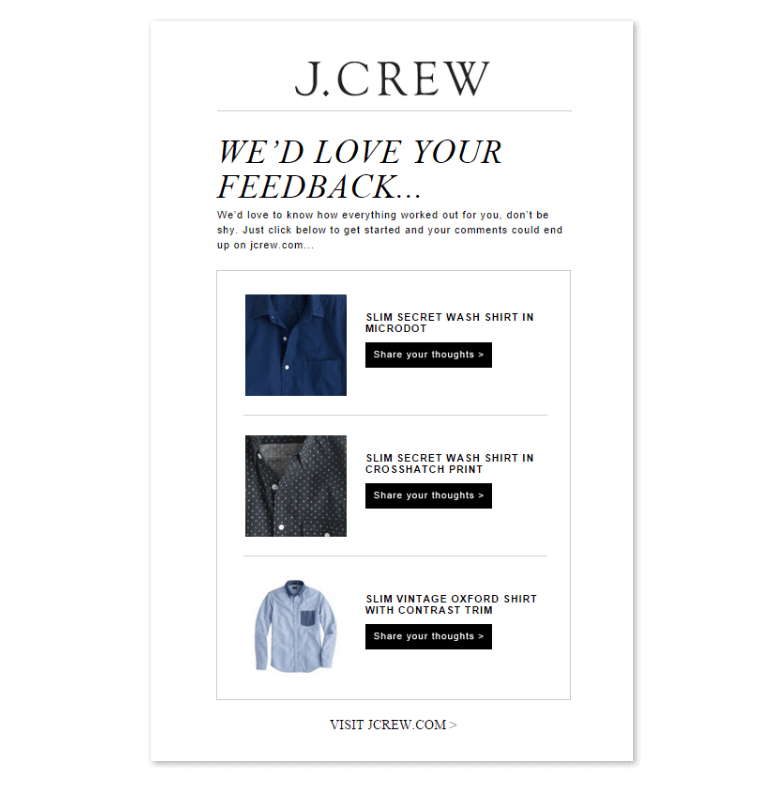 The emails highlight the need for a review with a large, prominent CTA that stands out from the text. The copy is compelling and makes the reader feel like there is something that still needs to be completed. Includes a short sentence about why it’s important to leave a review. Here’s another example that is very straight forward. The reader knows exactly what the company is asking for, but also why reviews are important to the company’s mission. The headline stands out in highlighted yellow. The CTA’s are clearly marked with large buttons. The vertical layout makes it easy see each product available for review. 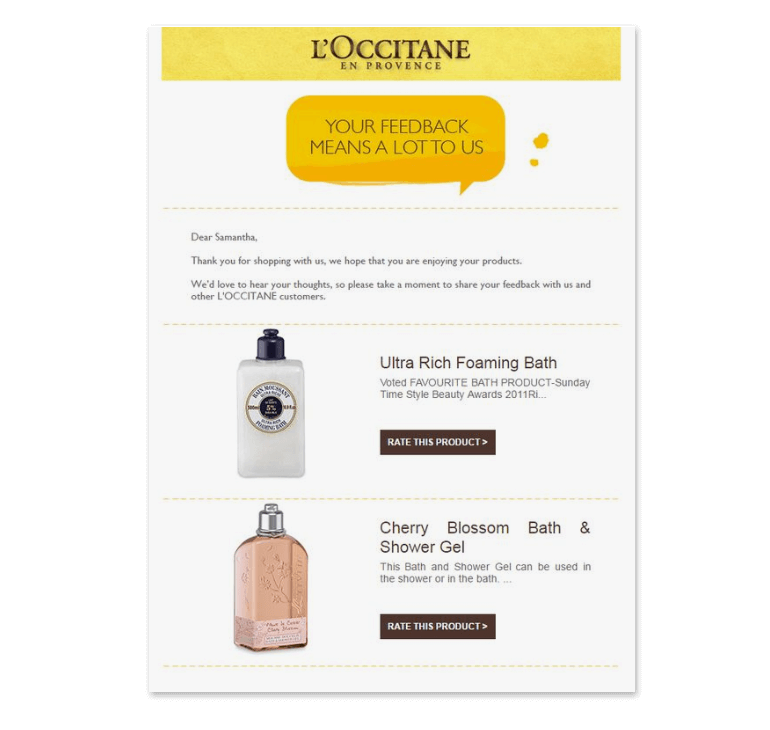 French skincare brand, L’Occitane, combines both a personalized intro paragraph and easy to find CTA buttons to make sure the reader can easy navigate to the product review page. It has a short personalized intro paragraph. The vertical layout is easy-to-read. There are buttons vs just linked text. Sephora has a truly unique way of collecting customer reviews. The company offers users a special area of their site called, My Beauty Bag. My Beauty Bag is a personalized area that collects the user’s favorite products and organizes recent purchases as well as product reviews. It informs the receiver of what My Beauty Bag is. Has links to go directly to each product review. 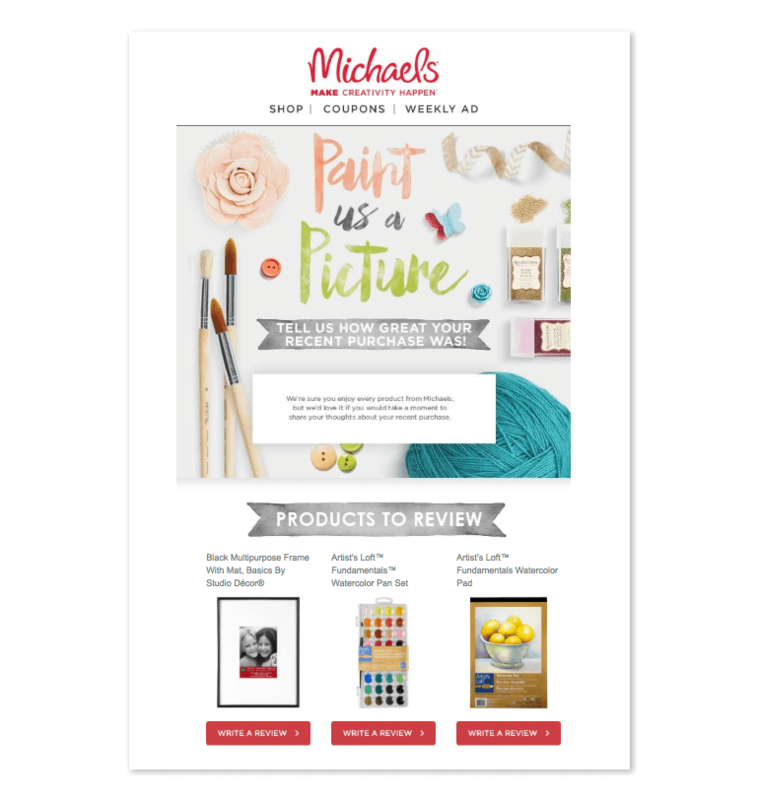 Michaels’ leave a review email is a fun play on arts and crafts and fits the company’s brand perfectly. What’s great about this email? The branding is on point for the company’s product offering. The copy offers a fun play on words. The products are clearly laid out with an image and CTA. Society 6 offers the ability to do the entire product review directly in the email. They make it easy by including the ability to leave a star rating for the product AND write your text comments without navigating away from the email. They also highlight their Instagram hashtag to help the company curate user content. Readers can leave a review without navigating away. Incorporates their social media strategy. Offers two different review styles. Target’s customer review email is a good mix of all the best elements listed above. 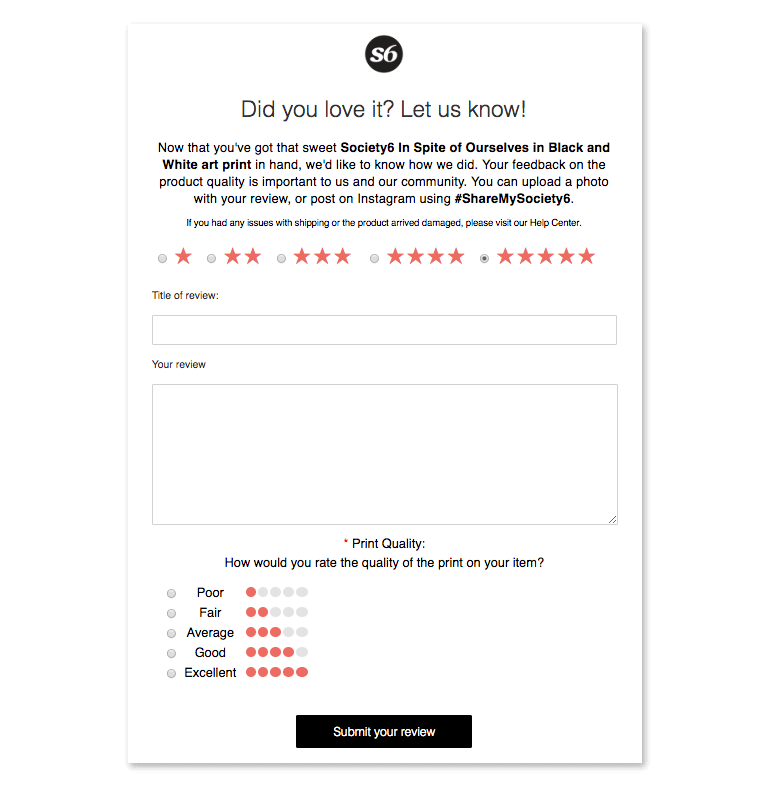 It has a clear title that stands out from the rest of the text; It offers an easy-to-see star rating that can be done directly in the email; and a bold CTA if you want to leave a more in-depth review. The star rating makes it easy to rate without navigating out of the email client. The headline and the CTA button stand out. Here’s how to get your customers to leave a product review. If your company is relatively new or only offers one or two products, it might be a better strategy to ask customers to review the company as a whole. Here are a few examples of emails asking for company reviews. 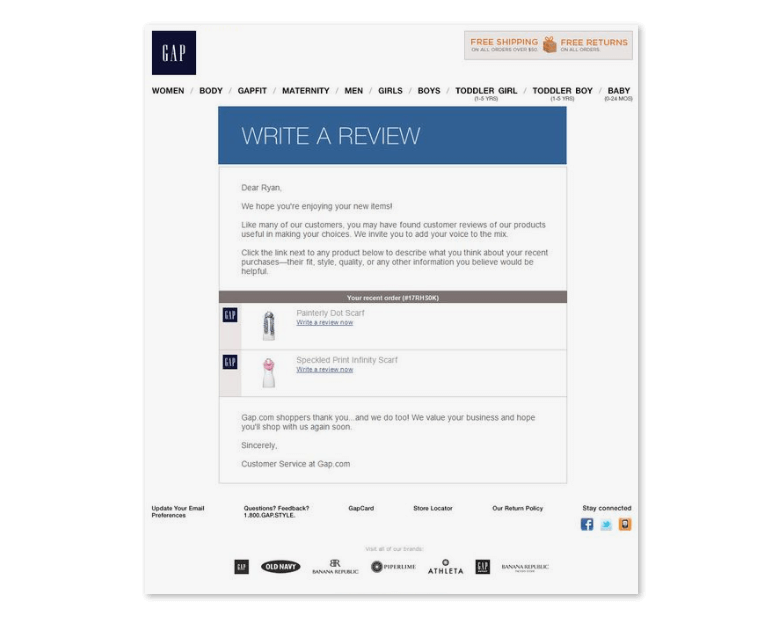 The results from PayPal’s email won’t likely end of on an external site, but it still offers a good example of how you can use customer reviews to adapt and improve your business. 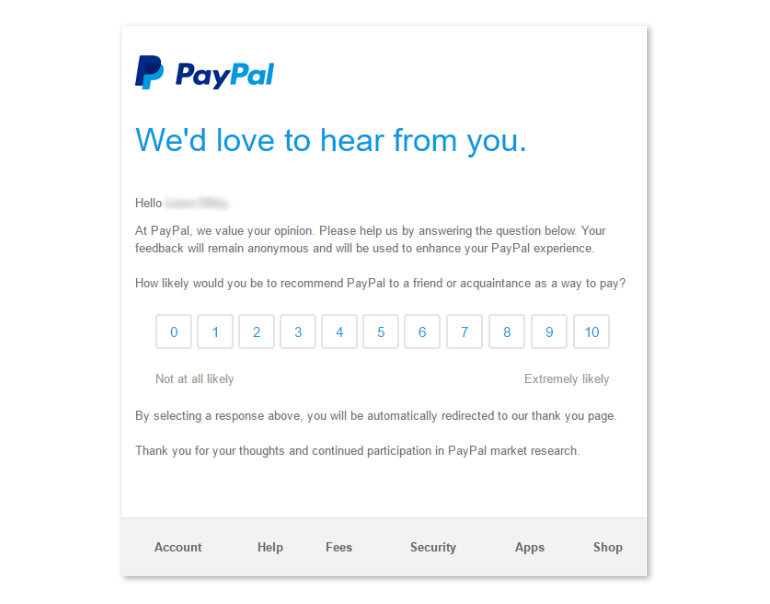 This example embeds a simple 1 to 10 scale where customers can rate their experience with PayPal. It has an easy-to-use rating scale. Explains what will happen after selecting a response. 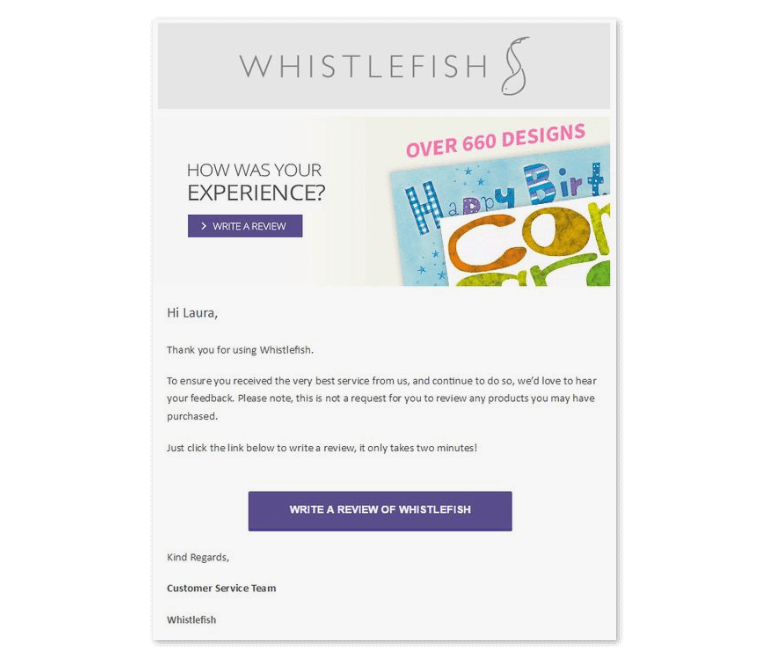 WhistleFish’s review email is a good example of how to ask for a company review. The email makes clear that they are not asking for a review of the products purchased. This is a smart way to set expectations and also ensure that the customer is writing a review that’s fit for purpose. They mention how long it will take the leave the review. The email is personalized and lays out that the company is asking for. Although this email isn’t sent from the restaurant themselves, this OpenTable example is a good one for the service industry. 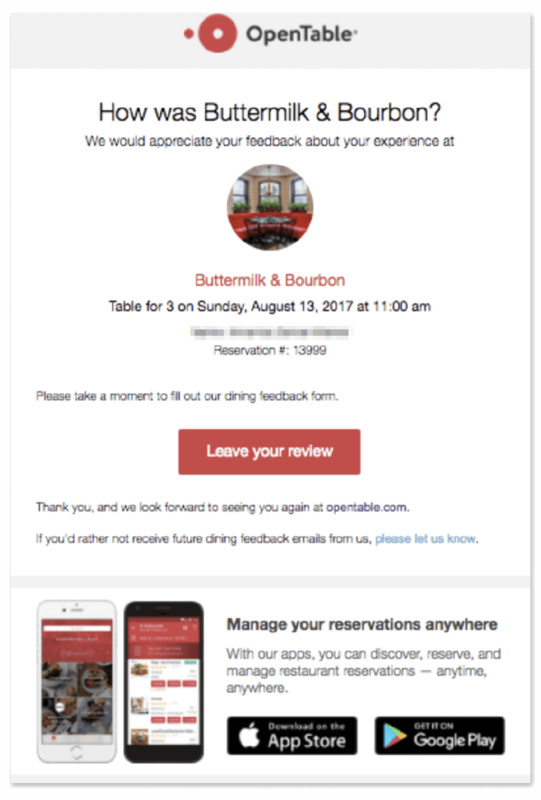 OpenTable is essentially the Amazon of restaurant reservations, so reviews are an important element for their community of users. Offers a small photo of the restaurant to remind the reader of their experience. Some companies choose to incentivize reviews by offering either a discount on the next purchase or by placing the reviewer’s name in a drawing for some type of prize. This makes for an “I scratch your back, you scratch mine" scenario. The FTC has some guidelines that regulate how companies can and cannot incentivize reviews. “Suppose you meet someone who tells you about a great new product. She tells you it performs wonderfully and offers fantastic new features that nobody else has. Would that recommendation factor into your decision to buy the product? Probably. The choice to leave a review must be optional. If the endorsement is paid, it must be stated as such. It’s better to offer a discount or a chance to win than something free. IF you choose to give something away for free in exchange for a review, you must reviewer must disclose this. Here are a few examples of companies which offer something in exchange for a customer review. 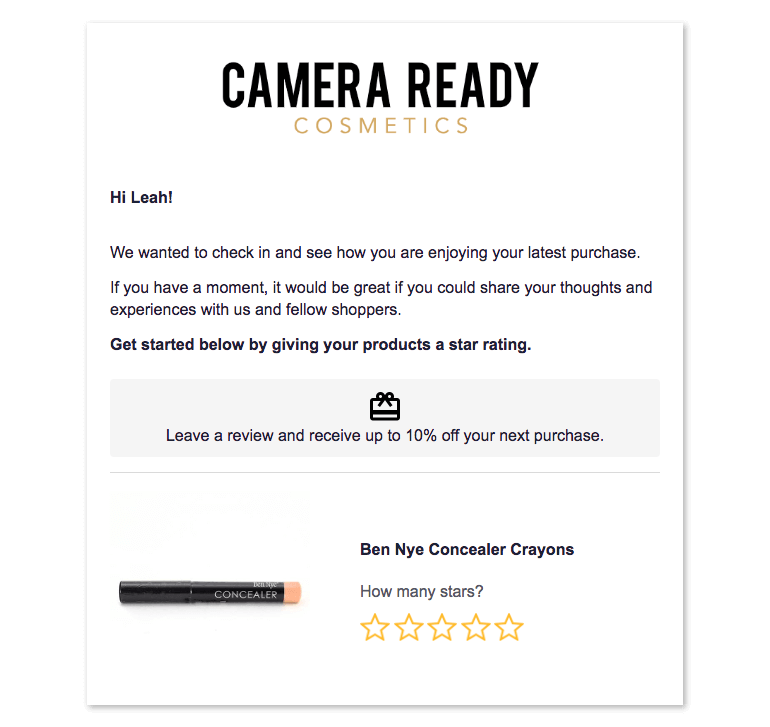 Camera Ready Cosmetics offers 10% off your next purchase in exchange for leaving a review. The email is both personalized and offers the ability to leave a a simple 1 through 5-star rating without navigating away from the email. It’s clear and to the point. You can leave a review without leaving the email. You receive 10% off the next purchase as a thank you. 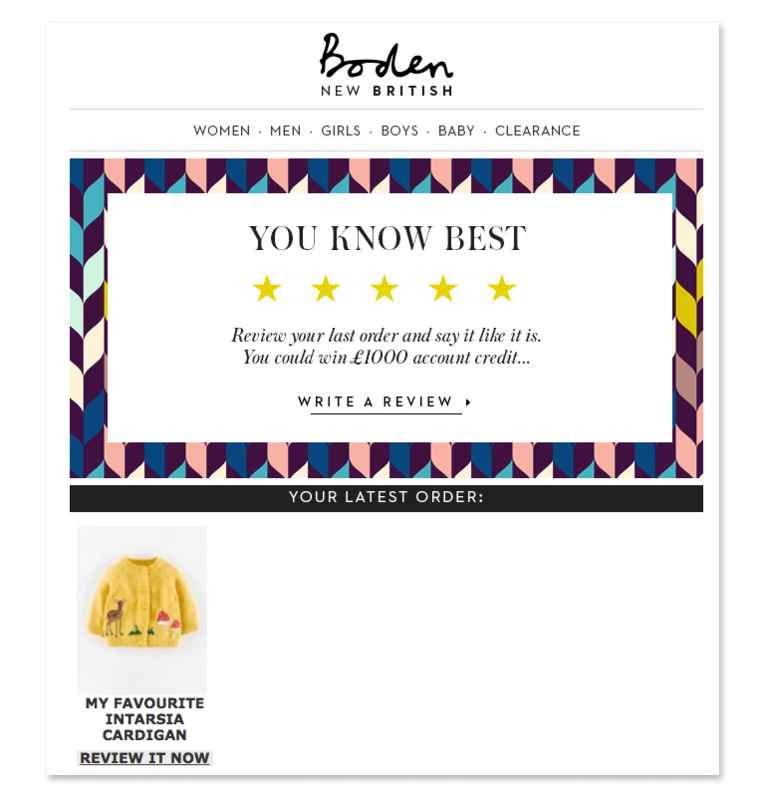 This email from Boden offers the chance to win £1,000 in exchange for an honest review. The company puts the offer front and center, followed by a summary of the products available for review. The branding of the email is fun. The company states it wants honest opinions. Tailor Brands offered a generous 50% off in exchange for leaving a review. States how much time the review will take. Has an engaging CTA – instead of the same old “Leave a Review” CTA. 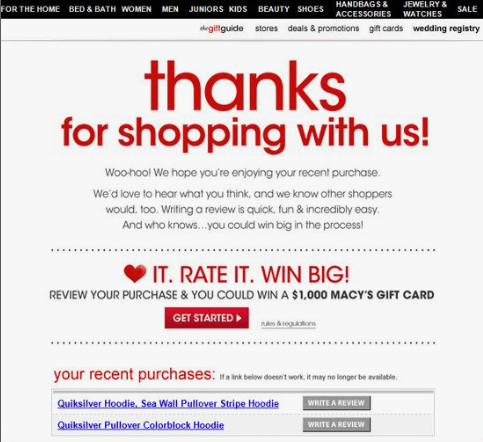 Macy’s offers another example of how you can hold a giveaway in exchange for a review. The company states that the reviewer will be entered for the chance to win a $1,000 Macy’s gift card. The copy isn’t boring - it doesn’t take itself too seriously. It offers a link the the content terms and conditions to learn more about what is required from the reviewer. 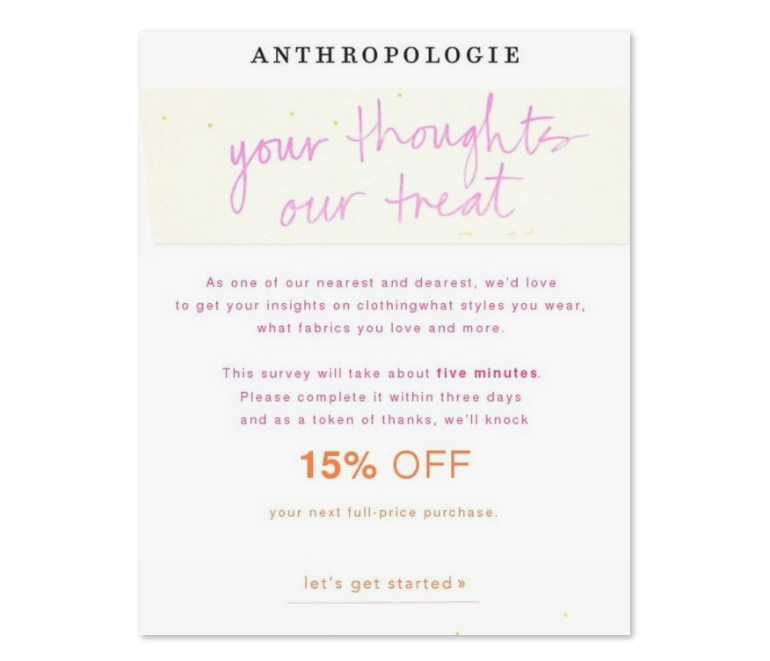 This Anthropologie email isn’t enquiring after the review of a specific product, but rather on the customer’s preferences and style. The outcome of a review like this could help shape the company’s product offering. It states how long the review will take. They offer a 15% discount in exchange for the reviewer’s opinion. 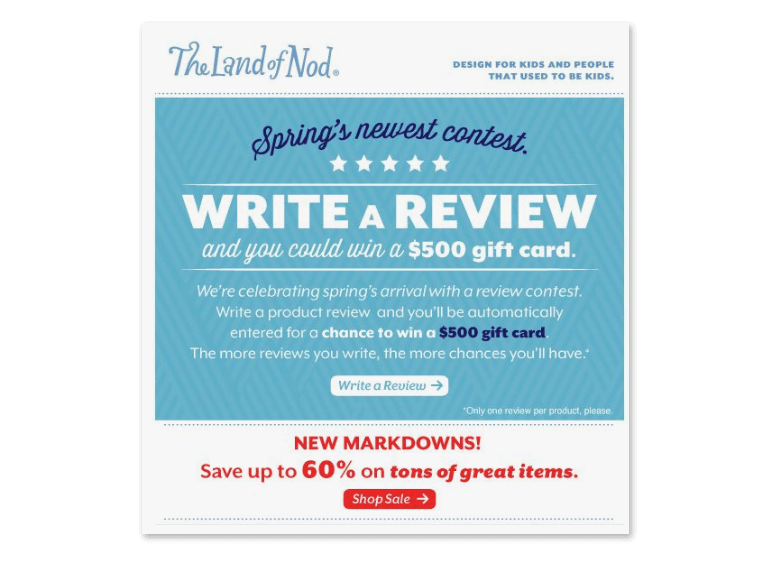 The Land of Nod held a leave a review contest where reviewers could leave multiple reviews for the chance to win a $500 gift card. The email spins it as a limited time contest, rather than just the average “enter to win” sweepstakes. Now that you’ve seen a ton of different examples of how various companies ask their customers for reviews, you can decide for yourself what’s the best way. Make sure you’re not bombarding your customers with too many emails. With CoSchedule, you can organize all of your marketing projects, email campaigns and social media so you never accidentally send out multiple emails to the same person on the same day. Schedule a demo today to see how we can get your team marketing team organized.